Before Choosing Jasper’s Catering Services: Louise has used several caterers over the years and, amongst other things, presentation to be far from perfect, found there to be a distinct lack of variation and quality was often hit or miss. And as if this was not enough she found the level of customer service to be consistently falling short. Sadly, stuck out in Newton-le-willows, she also had few catering options, as many corporate caterers were not prepared to come that far out of town, leaving her little option but to rely on the ‘butty van’ to feed her colleagues and clients. After Choosing Jasper’s Catering Services: After being approached by ourselves, Louise quickly decided to come on board. We wrote a couple of different menus that matched her requirements, surpassed her expectations in respect to quality and came in on budget as well. Louise has taken full advantage of the online facilities and receives automated order confirmation and receives her invoices direct to her inbox on the day of delivery. The biggest compliment we could have received was fact that Louise immediately recommended our services to her colleagues in another department of Galliford Try and they now enjoy the same fantastic standards. Thanks Louise. 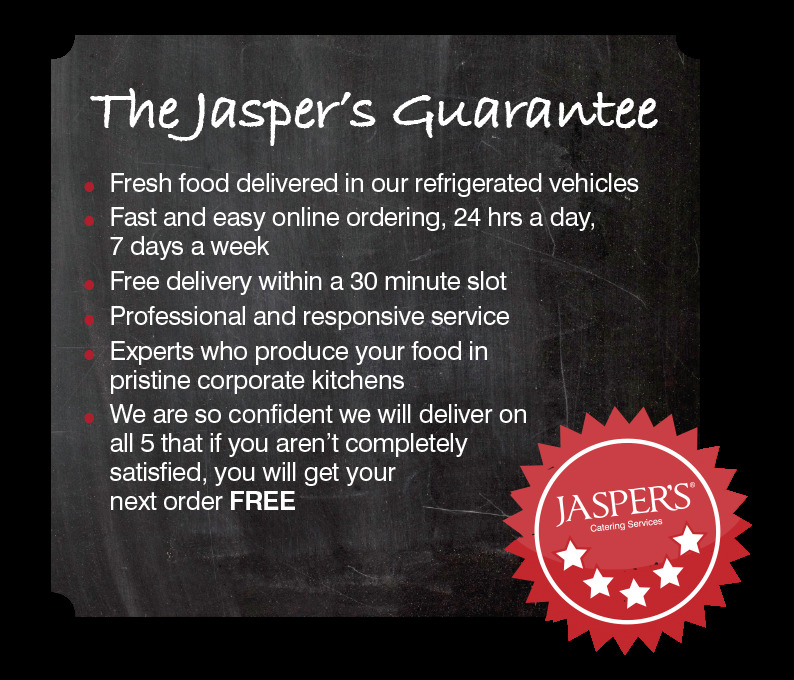 “Jasper’s Catering Services have been far superior than any other catering companies we have previously used. We were impressed from the start when Nick came out and sat down with us to find out our exact requirements, then quickly came back to us with our very own personalised menu’s set up for all our different types of meetings and at a great price. Do we need a new caterer, what’s wrong with our old one? Before Choosing Jasper’s Catering Services: Donna & Team, like many of the prospective customers we meet, were quite happy with their current caterer. And if they hadn’t been they were probably too busy to search for a new one, or at least one who wanted to pop out and design bespoke menus, especially as they were in the middle of moving to a massive new dispatch hub on Gemini, just off the M62… you may have seen it. “We originally used a local caterer who we “thought” we were happy with. This is until Jasper’s came along and basically blew them out of the water. From the first initial meeting 9 months ago we have received nothing but fabulous service, advice and most importantly delicious food. The food is presented beautifully, labelled up and arrives in cool bags so that we have the flexibility to serve when we need to without the food being ruined. We have an excellent relationship with Nick & the team, nothing is too much trouble. When we need to amend menu items or do something out of the ordinary they always accommodate with a friendly smile and follow through again with superb service. Before Choosing Jasper’s Catering Services: Leanne, like Donna @ Hermes, originally thought she had catering covered. Leanne provides her clients with the best service in Warrington and retains many a loyal customer because of this. The only problem was that she wanted to control their whole experience and this meant making her guests lunch herself with all her loving care. She would whizz round to the supermarket, grab her ingredients and create her own buffets on a daily basis, leaving little or no time to promote or publicise the business (BTW if you need a place to meet, google Flexible Meetings, you won’t be disappointed). After Choosing Jasper’s Catering Services: So after originally saying no to us, Leanne had a change of heart. After all, how much does it cost to source all the products yourself, then take the time to turn them into a beautiful buffet, whilst paying for your own time and transportation costs? Well, it turns out that it’s much more than you think when you sit down with a calculator and work it out – so she got back on the phone. After a short consultation it was apparent we could save Flexible money and it turns our love looks very similar to theirs. Leanne has proved an incredibly loyal and supportive customer ever since… thanks Leanne. “Ever since we came on board with Jaspers Warrington, life has been so much easier. I manage the serviced office space at Flexible meetings and our client regularly ask us for lunch (and breakfast for that matter). We used to prepare it ourselves but now, with the click of a button, we no longer need to think about the food because we know the quality of it and the service we receive means we have one less thing to worry about. When we first met nick he offered to design us a menu around our client’s very specific tastes and requirements, and we needed it branded in a PDF – well he definitely delivered. Before Choosing Jasper’s Catering Services: Angela & Cherie were one of our first customers to come on board back in September 2013. They agreed to have an appointment with us literally a week before we opened. At the time they were open minded about changing their supplier of 5 years as the food they had been ordering was often for management and more importantly, their customers. They knew that they deserved better presentation and quality for their money, but until our first appointment, no-onehad offered to come out and help them. After Choosing Jasper’s Catering Services: They have never looked back, ordering fantastic looking food that ‘WOW’s their Bosses and Customers alike. The girls at Konica Minolta can be sure their food offers them variety and consistently high level of quality. We have been able to improve all their issues with their previous supplier, offer them an improved price and given them a more personalised service. “We decided to take one of your free buffets [after your first appointment], for a next sales demonstration we had in our showroom. When the buffet arrived, the quality of the food was second to none, it was fresh, lovely presentation, great variety and tasted fabulous.